Mac released a new prolong wear collection. I was already a fan of the prolongwear foundation which I wear almost everyday so its no surprise that I’m in love with the rest of the collection. I was immediately drawn to two things :a beautiful baby blue eyeshadow and this bright orange lipliner. I had been rocking all kinds of orange lipsticks this spring/summer but never found a cool orange lipliner to accompany them. I passed on the eyeshadow and picked up this orange baby! I love it! I thought the formulation was going to make my lips feel really dry but it didnt. 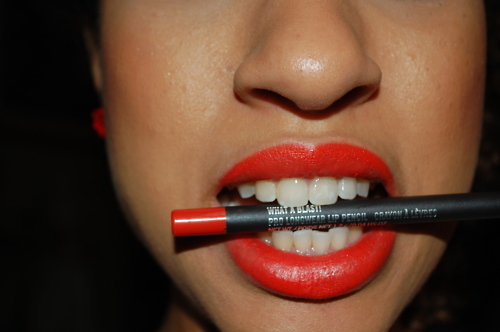 I filled my lips all over with the liner and topped it with morange lipstick. This lipliner really lasts! I wore it all day and it looks as if I just applied it. These lipliners are $4 more then the regular lipliners but I have to say they are well worth it. What do you think?